You can search for a Task using multiple criteria. In the Tasks area, click Search. Enter the search parameters on the right then click Refresh. Multiple criteria can be entered. Note: Click New Task to create a new task from the Task Search window. Double click a task to open it. User: Search for tasks that have this user in its description or notes. The default selection is All. Me is a quick method of selecting the logged-in user. Task List: Search in task lists (description) that have matching characters. Task Num: Search by task number (headquarters only). Description: Search task description and notes for matching characters. 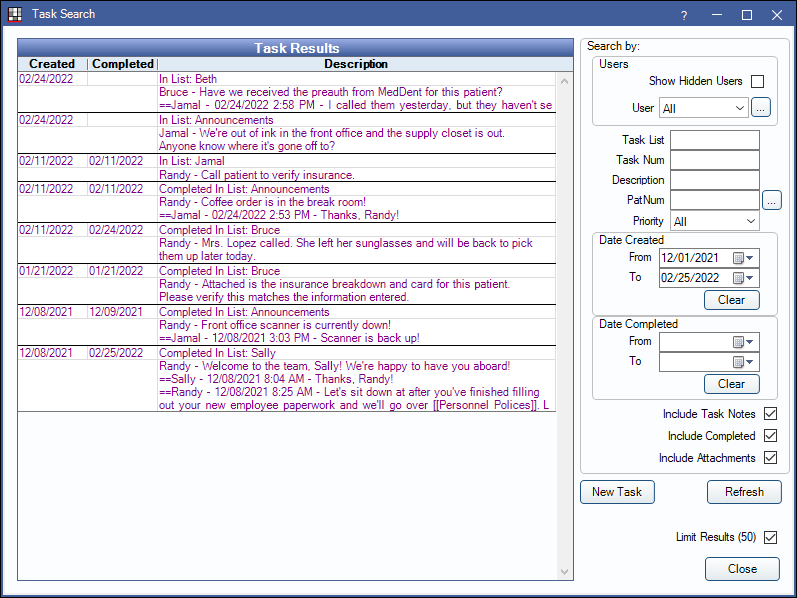 PatNum: Search for tasks associated with a patient number (for tasks that have a Patient type only). Priority: Search by task priority. Date Created (From / To): Search for tasks that have a Date/Time Entry between the date range. Click the calendar icon to select the to and from dates. Click Clear to clear all dates. Date Completed (From / To): Search for tasks that have a Date/Time Finished between the date range. Click the calendar icon to select the to and from dates. Click Clear to clear all dates. Include Task Notes: When checked, applies filters to task notes when searching. Include Completed: When checked, includes completed tasks in search. Limit Results (50): When checked, search results are restricted to 50 tasks. When unchecked, there will be no limit. Run on Report Server: Only visible for offices using a report server (Report Setup: Report Server). Check to run the task search query on the report server to avoid slowness.